Want to know more about St Kitts scuba diving? Read on to find out what PADI IDC Staff Instructor Terry Crookes has to say about scuba diving in St Kitts. Originally from the UK, Terry moved to St Kitts a few years ago, intending to go into semi-retirement. 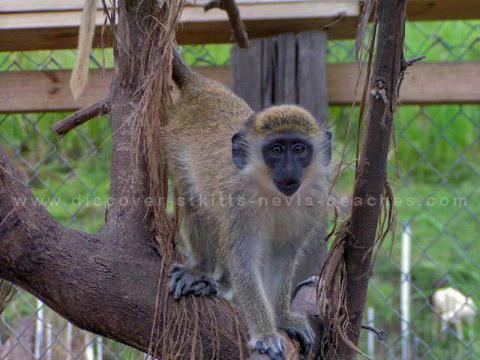 But as fate would have it, Terry now works full time as an instructor with one of the dive operators here in St. Kitts. I am grateful to Terry for penning this article and sharing his photos about St Kitts scuba diving for me to share with you, my Discover St Kitts Nevis Beaches family. I hope you enjoy the articles and the St Kitts scuba diving photos. 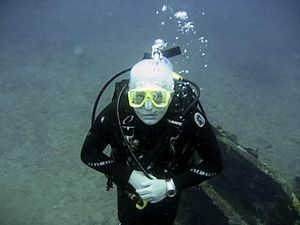 For more information about St Kitts scuba diving, be sure to visit the links to Terry's website in the article below. Part One: What's the St Kitts Scuba Diving Vis like? The Island of St Kitts has been described as "The Undiscovered Jewel" of the Caribbean because it is only in recent years that tourists have begun enjoying what St Kitts has to offer. 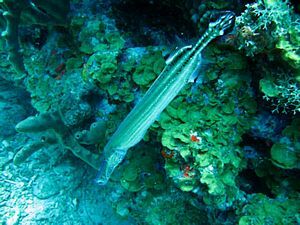 Likewise it is only recently that scuba diving tourists have discovered the range and variety of dive sites that St Kitts (and its sister island Nevis) offers. Sport Diver magazine described St Kitts as "some of the prettiest diving in the Caribbean" and gave it a 5 star rating, pretty good for an island where the diving is relatively undeveloped. By undeveloped I mean that the St Kitts scuba diving sites are relatively little dived and very few show any signs of human activity. 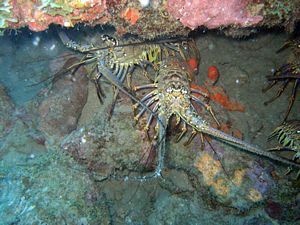 There are only 3 dive operators in St Kitts (1 in Nevis) and it is rare indeed for 2 dive boats to be on the same site. Less than 20 "recognised" dive sites are listed by the operators. One travel guide stated that "what St Kitts lacks in quantity it makes up for in quality", a fair comment but not one that is entirely true. 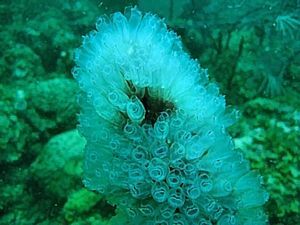 As I have found after 200+ dives over 2 years in St Kitts, there are many sites that are unnamed, undiscovered and offer some excellent diving conditions. 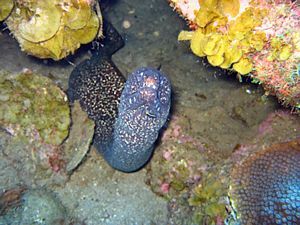 It is an amazing experience to dive a reef knowing that only a handful of divers have been there before. Sea temperatures are around 79°F in winter 86°F in summer. Visibility is 60 to 100 feet all year. Currents are rare and waves are usually slight, that makes for excellent diving. 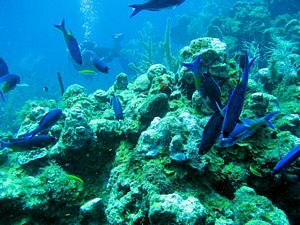 Clear unpolluted waters, very little "at sea" human activity and a lack of pollution means that we have been spared the dying reefs and the coral damage so common on many Caribbean islands. 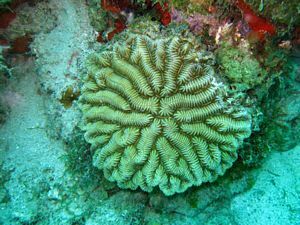 Our Soft Corals, Sea fans, Tube and Barrel Sponges are in excellent condition while the Hard Corals of many species continue to thrive. Many of our sites are multi level, you will often find depths of 50ft to 100ft on the same site. Mini walls dropping away to sandy sea beds, volcanic boulders covered in Fire Coral and Sponges, large Coral Plates giving cover to Lobsters and Nurse Sharks, you will find them all in our underwater world. I am not going to list all the sites here, you will find my own detailed description of St Kitts and Nevis dive sites on my website. It is 9:30 am, the skies are clear, the sun is shining and as the water envelopes me I am once again in my element and wondering what the day will bring. 60ft down and I am on the top of the reef watching a Trumpet Fish wind its way amongst the Purple Sea Fans. 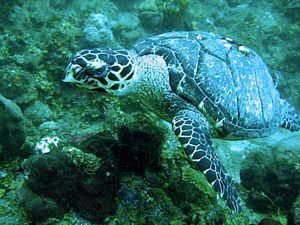 He looks exactly as I feel, at home with his world, relaxed and cruising gently along the reef. We cross the top of the reef, stopping to have a look at a pair of Spotted Drums swimming amongst the coral. I am also amused by a small Trunkfish. Reaching the ridge we see below us a gently sloping wall, a quick check of my air gauge and slowly I start to descend. This wall is volcanic in origin, dark rocks covered in Corals with Sea Fans and Sponges protruding out like branches of a tree. In amongst the rocks I see a Spotted Moray, always looking threatening with his mouth open and teeth bared. A little lower and out of the corner of my eye I spot movement, two long antennae are protruding from a hole and behind them is a Spiny Caribbean Lobster. 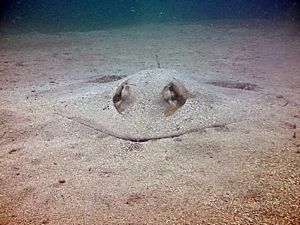 The wall drops to 100ft on the seaward side and lying partly buried in the sand is a beautiful Southern Stingray. The Stingray senses our presence and slowly and gracefully swims off into the blue. Not wishing to linger at this depth we swim along the wall ascending all the way back to the top of the reef. 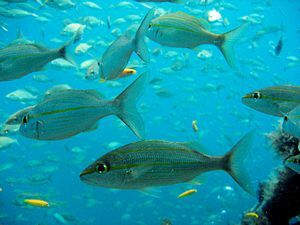 Hundreds of small Creole Wrasse await us on top of the reef, they swim around and between us, a seething mass of blue and yellow motion. 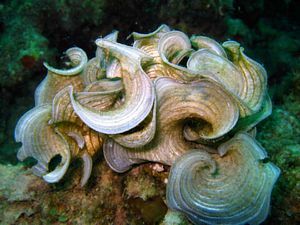 This section of the reef is covered in green Tube Sponges and dark brown, almost black, Barrel Sponges, tiny fish of all species dart in and out among the coral. It is time to make our way back to the boat and as we do so, I get the feeling I am being watched, I turn around and coming out of the turquoise depths is a large Barracuda. He comes in pretty close checking out who is in his territory and then swims gracefully away. Back aboard the boat we discuss the dive, we are diving with Pro Divers St Kitts and Auston Macleod the owner tells us that this site has no name, why? because no other operator dives it. 27 yrs of St Kitts scuba diving means he has a discovered a lot of dive sites. Knowing that I am one of only a few divers that have dived here adds to the mystique of the site. Someone suggests we call it "The Deep Blue Dream", personally I think something like "The Mud Spot" will probably help to keep it a secret place for many more years. This 144ft long freighter was sinking in Basseterre harbour in 1981 and so was towed to its current resting place. Hurricane Hugo in 1989 split it into two sections and the Bow and Stern sections now lie about 50ft apart. Sport Diver magazine listed this as one of the top 20 wreck dives in the Caribbean, a title it thoroughly deserves. We descend 40 feet onto a sandy bottom only a few feet from the Bow section. We are much nearer the shore here and while the visibility is not as good as our first dive, I can see the hulk of the Stern section away to our right. I have done this dive many times before, but it always holds surprises. Today is no exception, a large Southern Stingray is resting on the deck plates just before the entry to the swim through, I have seen many Rays in the sand here but one this large on the deck is a new experience. I always describe this site as a "wreck with as much life as a reef", the entire superstructure is covered in Sponges and Soft Corals, shoals of Yellowtail Snapper and Smallmouth Grunts are common. 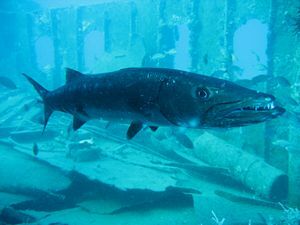 The wreck also has a resident Barracuda (we call him George). There is an easy swim through here and as I emerge onto the foredeck, George is waiting and watching. This is his home after all and no, he does not move out of my way, I have to swim around him! George and I became friends when I took some video of him last year, amazingly he stayed around long enough for me to get some fantastic close up video of a large Barracuda. The stern section yields an abundance of fish life, along with a couple of large Lizard Fish lying in the sand. Our resident Hawksbill Turtle is missing today and unusually we fail to spot an Octopus curled up amongst the steel plates. As we return to the boat we have all enjoyed an excellent shallow dive. The photographers amongst us (including me) have had a great time, the new divers have had a wonderful experience and even the most experienced diver has been impressed by the abundance of life on this wreck. Myself, I have lots of new photographs for my "St Kitts scuba diving underwater world" album. Terry Crookes is a Padi IDC Staff Instructor who has been living in St Kitts since 2007. His website mystkittsdivebuddy started out as a way of telling his dive buddies back in the UK about scuba diving in St Kitts. 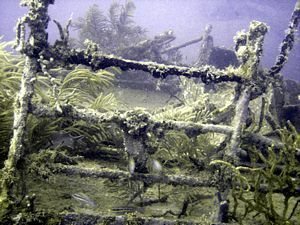 Since then it has grown into a detailed resource for anyone considering scuba diving in St Kitts. NB - The copyright to all the St Kitts scuba diving photos on this page is owned by Terry Crookes.